When I was a kid, there were times when I found myself thinking about some odd topic or other and would stop and say to myself, "Now where did that come from?" And I'd work the logical chain backwards. Okay, I was thinking about W, and that led to X, which led to Y and then to Z.
Surfing the internet can be like that at times. I surfed over to Comics Should Be Good, which is having a poll on next month's features. One of the features was "When We First Met" and so I read about the first time Lois suspected Clark was Superman. A very cool post, I think you'll agree. In the comments, someone pointed to a comic strip take on the Superman/Lois relationship. Cool and funny stuff. 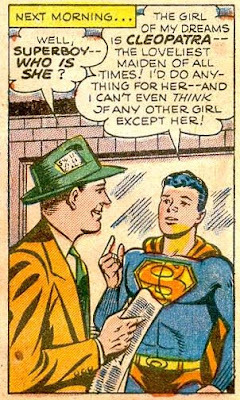 And at the bottom of that post, was a link to this pitch for a Lois Lane, Girl Reporter series of young adult novels. Nice art, interesting idea. 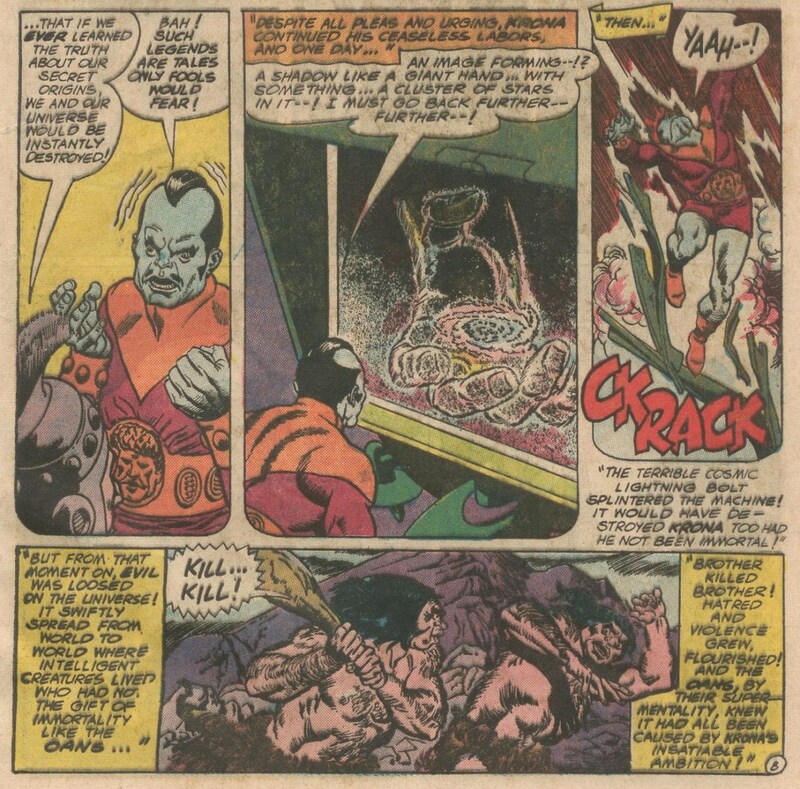 Elsewhere, Commander Benson has a very challenging trivia quiz for Silver Age Marvel zombies. How challenging? Well, I couldn't get any of them off the top of my head, although I did know where to look for a couple of the answers. BTW, don't scroll down to the comments on that post, as most of the answers are there. When you give up, here's Commander Benson's answer sheet. With the release of the Green Lantern movie, Jacque Nodell posts a picture of herself with her grandpa, GL co-creator Martin Nodell. 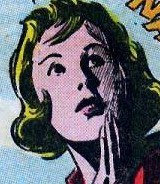 From the brief Black Widow series in Amazing Adventures. As you can see, he could draw some exceptionally beautiful women. 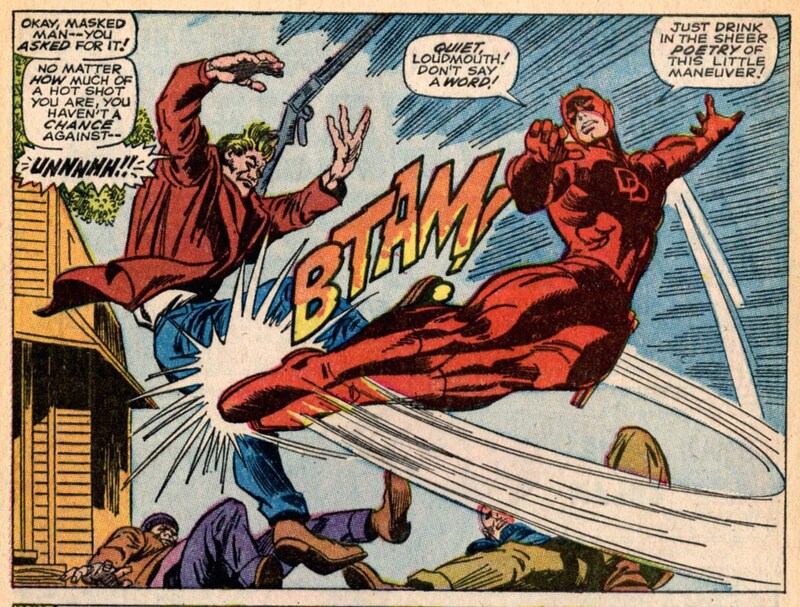 From My Greatest Adventure #74. Note the almost photographic quality of her face. Note the action, and again the photographic realism of the man's face. It looks easy. I confess I had not read this story in decades and it didn't make much of an impression on me back as a teen. But re-reading it last night, I have to confess I was flabbergasted. Since one of their fellows had unleashed evil on the universe, they started the Green Lantern Corps to battle the malignant forces. 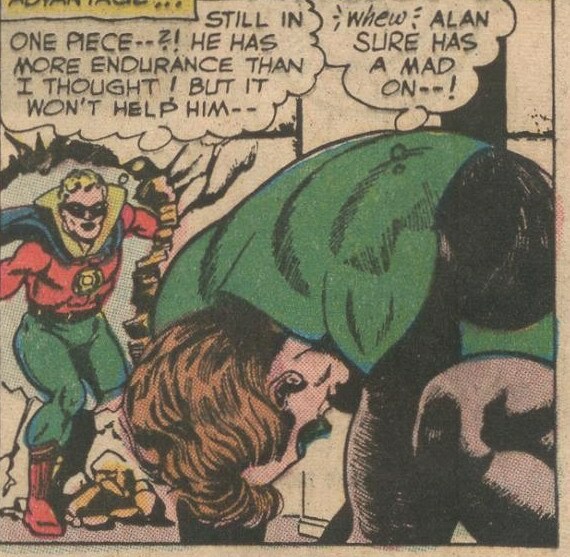 Via a flashback, we learn that Alan's body has secretly been taken over by Krona, and that the Guardians are being controlled by the GA Green Lantern's ring. 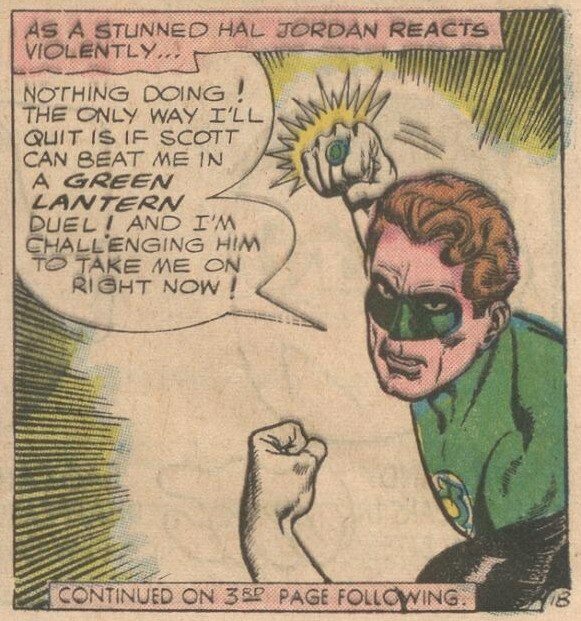 But (and this is a key point) Hal doesn't know this yet. So his revolt against the Guardians and his battle with Alan are not excused by this knowledge. We can see that Krona is rather reckless with other people's lives but not his own. But Alan's disembodied mind contacts Hal, wakes him up, and the two combine their willpower to defeat Krona, with the aid of some trickery; Hal uses the GA power ring rather than his own so that yellow won't work against it. 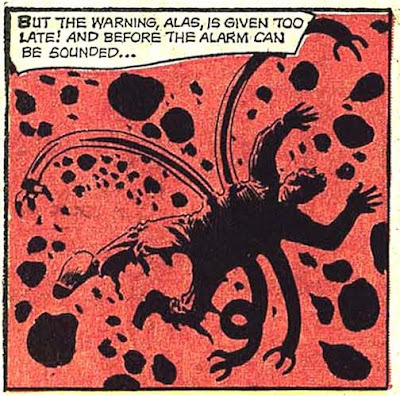 Krona is sent back on his endless journey, but this time the Guardians make sure his orbit will never intersect any planet or star. But you can also read it as anti-science, and anti-Darwinian. 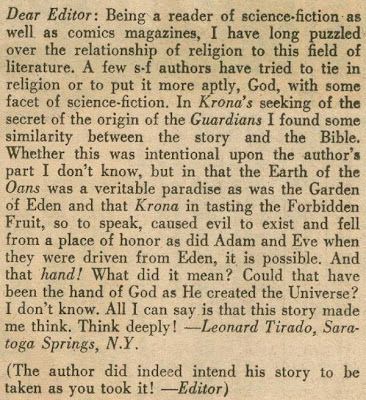 That the Oans turn out to be correct in their ancient superstition against studying the origin of their species is hardly surprising. It's a basic principle in fiction that the Cassandras of doom are always proven right (as was the original Cassandra, who warned the Trojans against bringing the wooden horse into their walls). But I have a hard time believing that the Oans were justified in their original banishment of Krona. 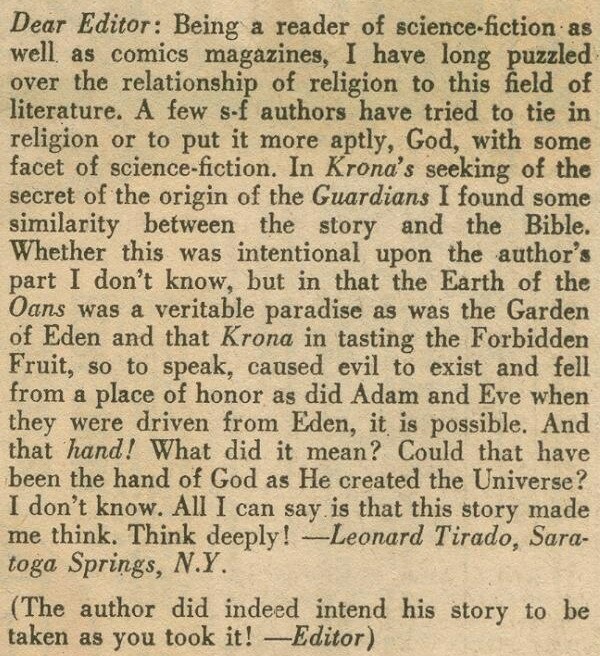 Given what happens in this story you can argue that the subsequent exile was merited, but you can also argue that ten billion years as a disembodied mind might be the cause of his callous disregard. 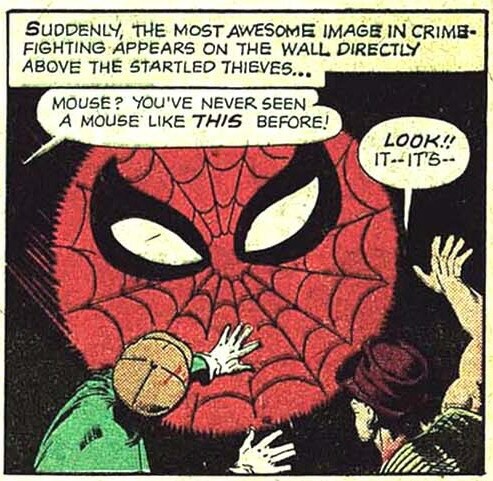 Anybody who read only the Steve Ditko issues of Amazing Spiderman would know exactly who was Spidey's arch-enemy, and it wasn't the Green Goblin. 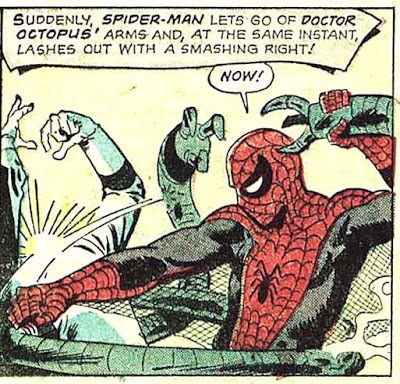 It was Dr Octopus, who was the first villain to appear in a two-part story (ASM #11-12,) the first to appear in a three-parter (#31-33), and who also headlined the first Spiderman Annual. It's a neat reversal of the Bat-Signal, indicating that trouble is here for the crooks who see it. 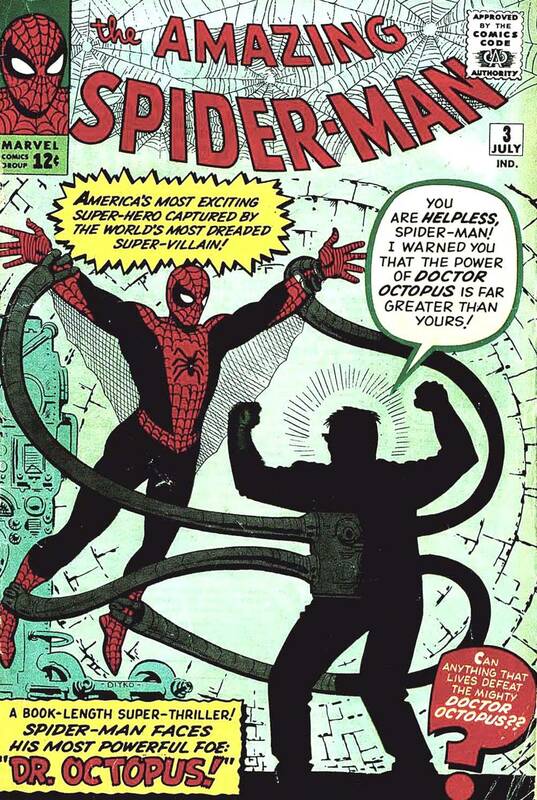 I don't recall it getting much use in the Romita era, other than on the cover to ASM #72. 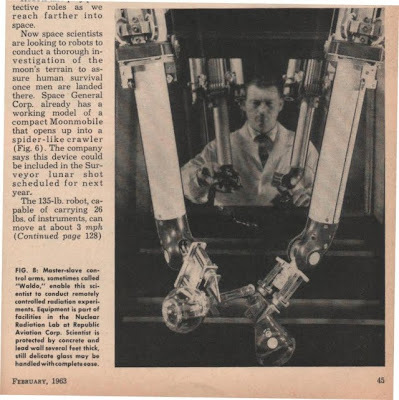 Incidentally, the name "Waldo" for that device, which allows scientists to handle dangerous chemicals and elements from behind a protective barrier, comes from a Robert Heinlein short story. With the result that the arms are grafted to his body and he's just a mite touched in the head. He takes over the hospital where he's been recovering. 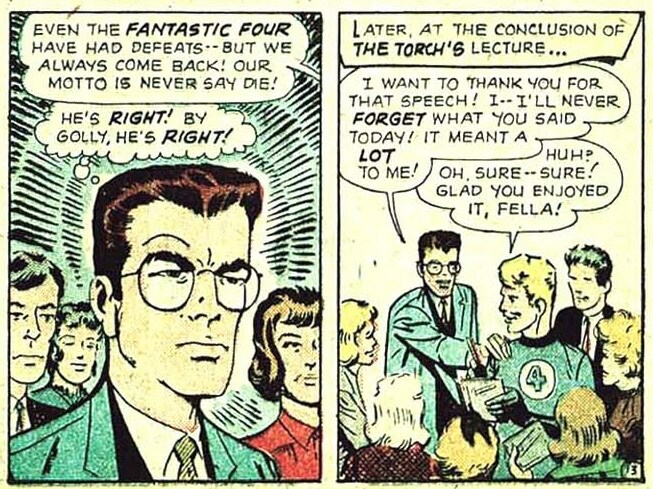 Peter gets involved when JJJ demands that he obtain some pictures. As with Clark Kent's job at the Daily Planet, Parker's employment at the Bugle guarantees he'll know where he's most needed. Comments: Solid, entertaining story with the usual terrific Ditko art. I particularly liked the bit with Peter sulking about after being beaten; that's a common teenaged reaction. Covered adeptly by Bill Jourdain. 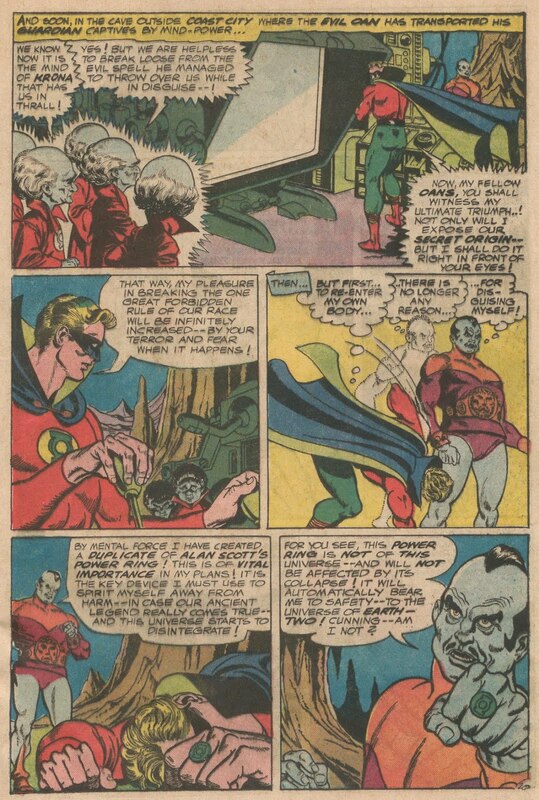 The post contains lots of information that I was not aware of previously, including the fact that DC Comics had formally passed on the Superboy concept, and then published the first stories (starting in More Fun #101) while Siegel was in the army and without his consent. The Guardians stripped him of his ring and power and banished him to the evil anti-matter universe of Qward (which Green Lantern had battled previously in GL#2-4). 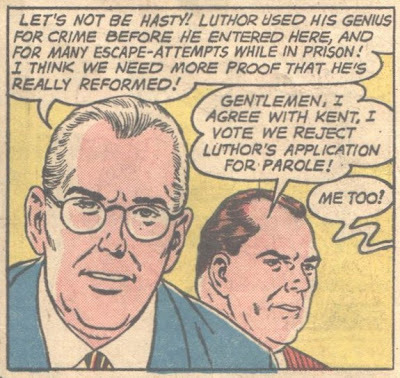 But as it happens GL misses his appointment in Valdale, and thus, unlike the 100,000 citizens of that fair metropolis, is not teleported to Qward. At the end of this back story, the Guardians decide to allow him to know that he works for them. 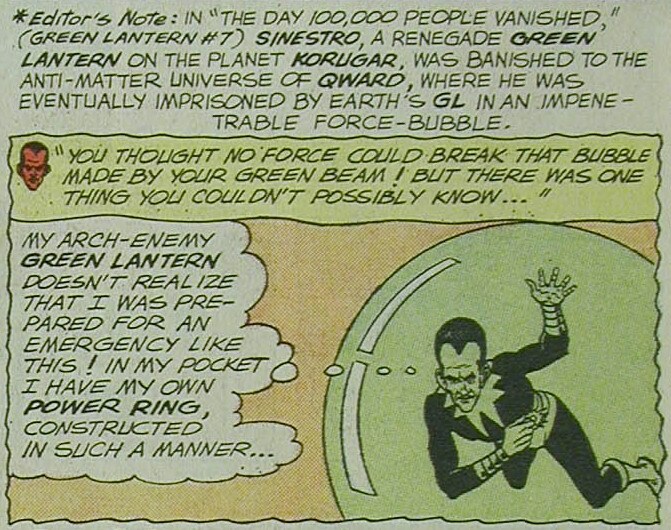 The Guardians put Sinestro in a capsule and launch him on an 18,000-year orbit of the universe. It's all terrifically eeeeevil, but Sinestro makes one mistake; he decides to televise GL's death, and the beam he uses to do it turns out to be purple, giving Hal his one chance at escape. 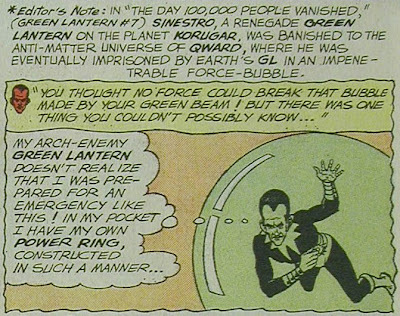 He fixes the mind control machine so it will work on Sinestro, and locks the villain away. 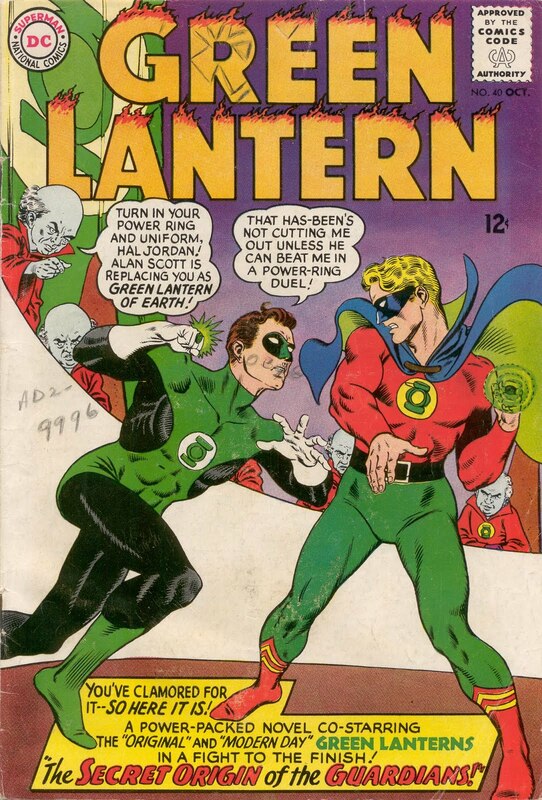 This time his plot is to steal the giant power lantern on Oa, but Green Lantern foils the plot with the assistance of the Golden Age GL and Doiby Dickles. Sinestro returned one final time in the Silver Age, in GL #74, in which he teams up with Star Sapphire. 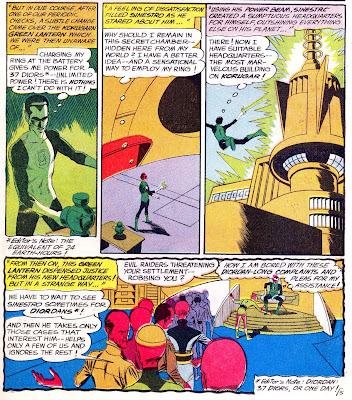 Overall, the qualities that I would associate with Sinestro and hope will appear in the movie, are his preparedness, and his desire for revenge against GL and the Guardians. 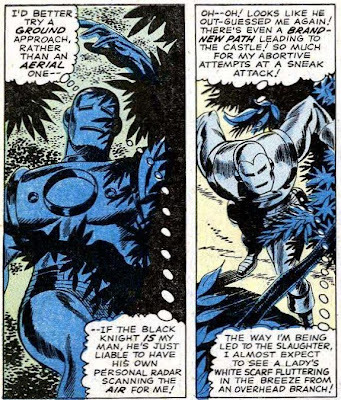 A long time ago, I talked about Tin, the Metal Man who was arguably the bravest character in the Silver Age, because he always showed great valor despite obviously lacking an iota of self-confidence. All the while blustering about what a mighty warrior he was. Hogun looks a bit like Attila the Hun, and Fandral was inspired by Errol Flynn's version of Robin Hood (and would later inspire Green Arrow's extreme makeover). Volstagg himself was based on the character of Falstaff, who appeared in three Shakespeare plays, most notably the two parts of Henry IV. In the first part, Falstaff is the drinking and debauching companion of Prince Hal (the future Henry V). 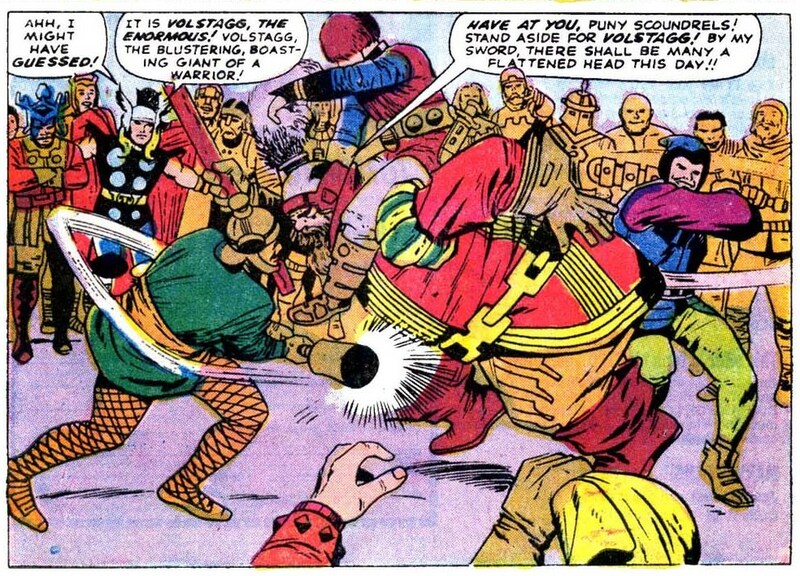 Like Volstagg, he's portly and given much to braggadocio, and is the frequent subject of the jests of his companions. 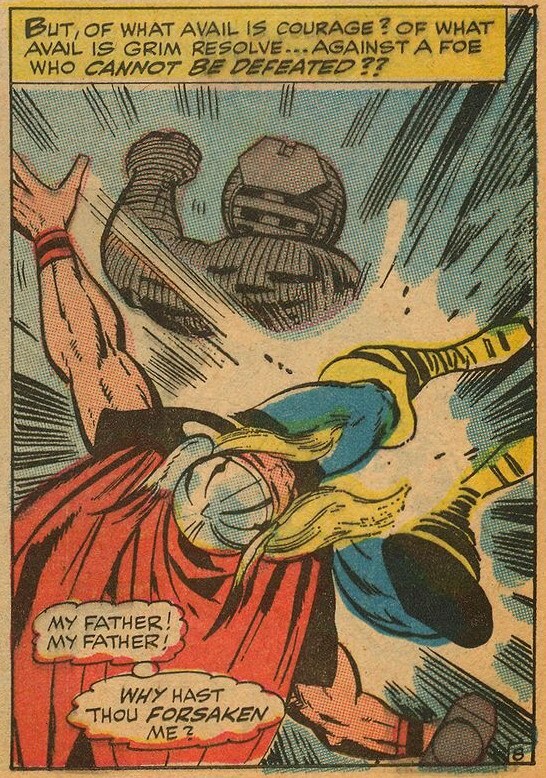 Thor himself can be seen as similar to Hal; the son of the King who sorely tests his father's patience yet shows great heroism. Falstaff is repudiated by Hal in the final scene of the second part of Henry IV, as a sign that the young prince has renounced his former dissolute lifestyle and is ready to assume his duties as king. 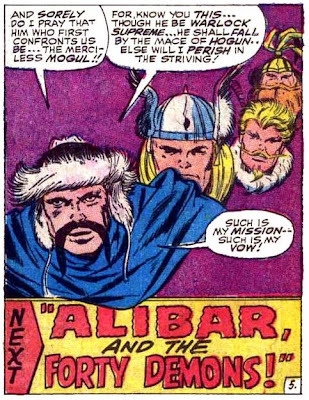 As far as I know, Thor never similarly abandoned Volstagg. This further emphasizes the comical nature of the character. Plastic Man had a long and storied history in the Golden Age of comics with over 100 appearances in Police Comics, most of which had him as the cover feature and 64 issues of his own magazine. He outlasted all of the GA superheroes with the exception of Superman, Batman and Wonder Woman. Part of this was due to the artistic genius of his creator, Jack Cole. 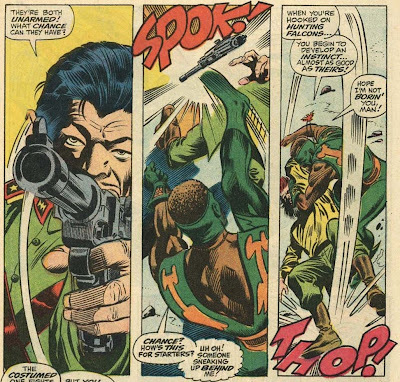 Cole was a master cartoonist and he made full use of his talents to make his pliable character as amusing as possible. When Plas laughed, Cole contorted his features so that he resembled a braying donkey. 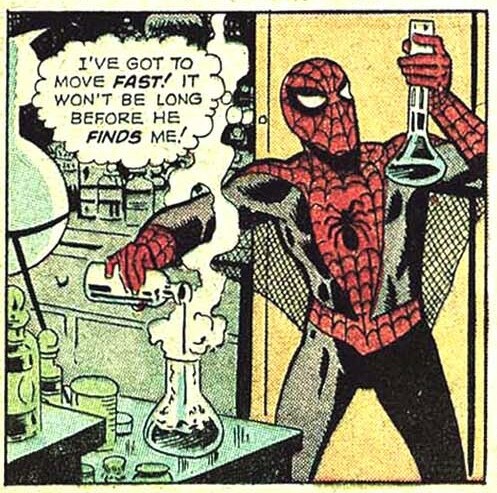 A recurring theme had him changing himself into an inanimate object, such as a couch or a rug or a lamp in the crooks' hideout, only to reveal himself at the critical moment. 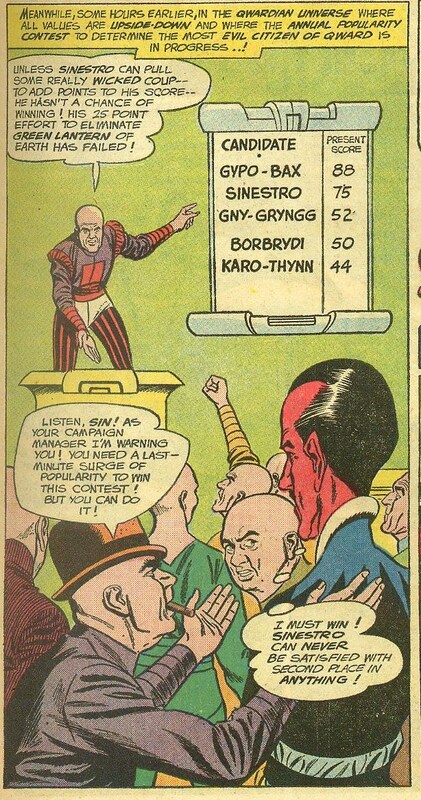 Plastic Man's adventures were published by Quality Comics, which sold out to DC in late 1956. DC continued several Quality titles, including Blackhawk, GI Combat and Heart Throbs, but Plastic Man did not make the jump. If this seems puzzling, remember that superheroes were at their all-time low in publication around this time; Showcase #4 had been issued a few months earlier, but several publishers had tried and failed with superhero revivals of Captain America, the Human Torch, the Blue Beetle and a new hero called Captain Flash. 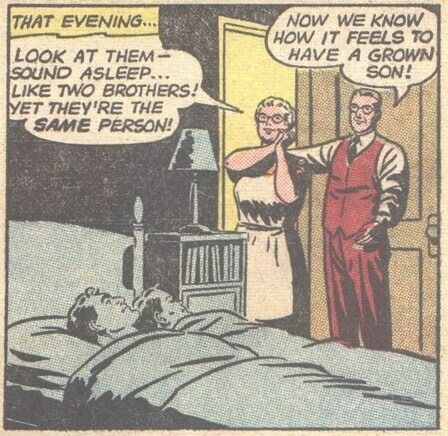 And so Plastic Man slumbered for a full decade. Meanwhile, several other characters were introduced who ahem, borrowed his stretching abilities, including Reed Richards aka Mr Fantastic, the Elongated Man, and Elastic Lad. In House of Mystery #160 (July 1966), Robby Reed used his Dial H for Hero skills to transform himself into Plastic Man. Shortly before that, however, Jules Feiffer published his landmark book, The Great Comic Book Heroes. This was one of the very first books to take comic books seriously, and reprinted many classic Golden Age stories, including the origin of Plastic Man from Police Comics #1. 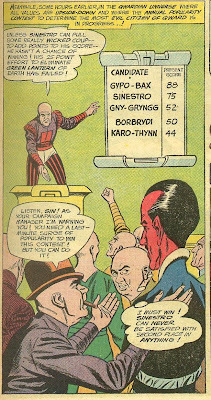 DC evidently felt confident enough in Plastic Man to launch him directly into his own title, something of a rarity for the company in the Silver Age. I would attribute this to a confluence of several factors, including the runaway success of the campy Batman TV series, the increasing influence of Golden Age fans who remembered Plas from their youth and the success of Feiffer's book. Unfortunately, those are also probably the reasons the series failed. First, the Batman fad imploded like all fads do, and superheroes who were anything less than super-serious were no longer cool. 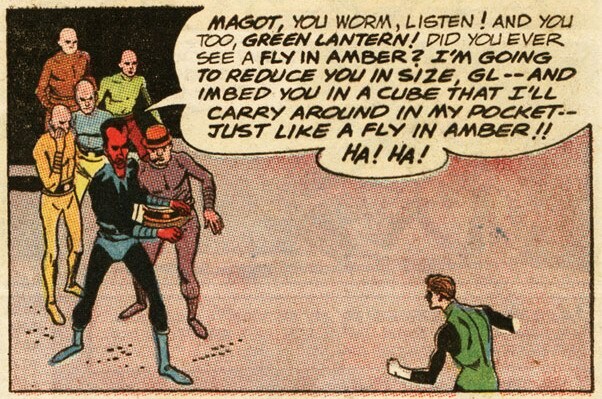 And the new Plastic Man was not faithful to the Golden Age character, doubtless turning off the older fans. But I suspect that's one of the secrets of great cartooning; it has to look effortless, with very simple lines. The chemistry wasn't there between them. 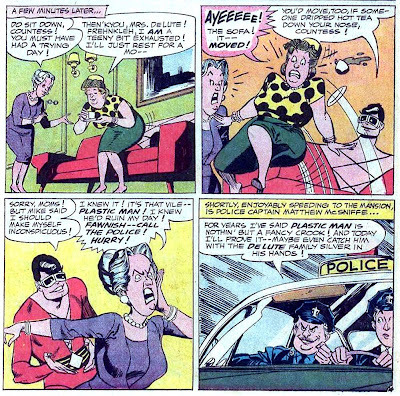 In the Golden Age, the goofy sidekick was a staple of superhero comics, from the Flash's Winky, Blinky and Noddy to Green Lantern's Doiby Dickles and Wonder Woman's Etta Candy. Indeed, Alfred, Bruce Wayne's butler was initially played for laughs. 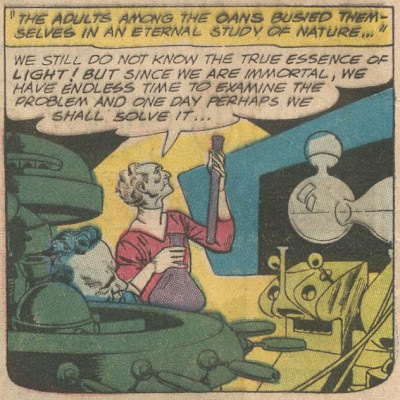 But for the most part they were not reincarnated in the Silver Age. Gordie mostly comes off as Bud Abbott to Plastic Man's Costello; a straight man or foil. 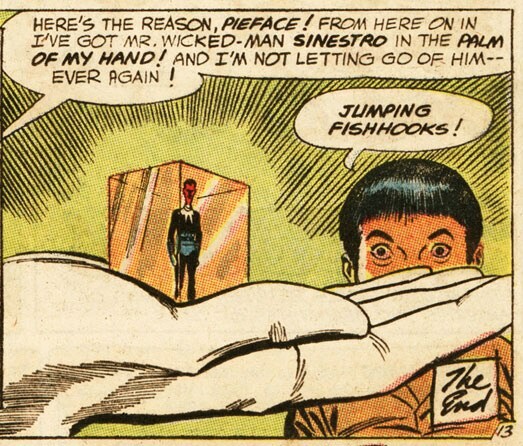 That bit with the cops calls to mind that the Golden Age Plastic Man was originally a crook named Eel O'Brian, but after being left for dead by his gang (and gaining his powers), he turned into a crimebuster. 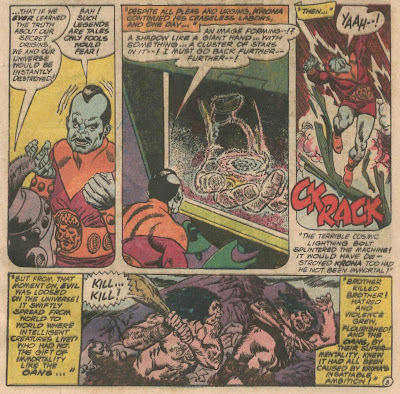 Dr Dome sends the second greatest villain, Professor X (no, not that Professor X) to attack Plastic Man, but our hero manages to defeat him. At one point the curvaceous daughter (named Lynx) seduces him and slips a mickey in his lemonade, then dumps him into the ocean, but he gets away from that death trap as well. 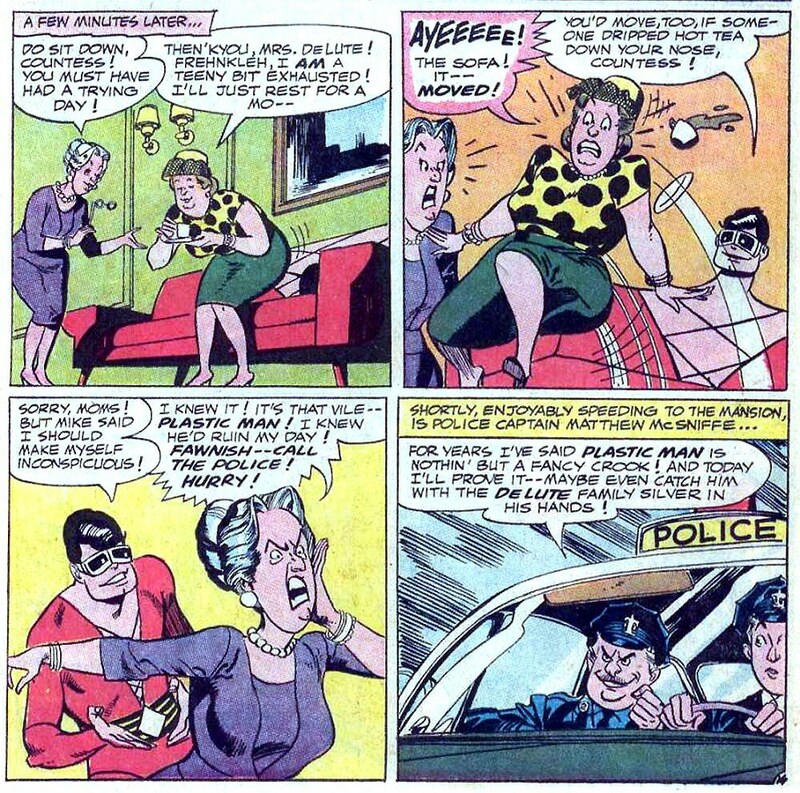 The series meandered on for ten issues, with Win Mortimer taking over the art duties starting with #2, and Jack Sparling sitting in for the final three installments. 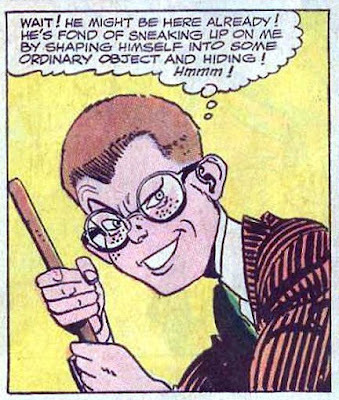 Although the series was mostly forgettable, it did have the salutary effect of introducing Silver Age readers to Plastic Man. 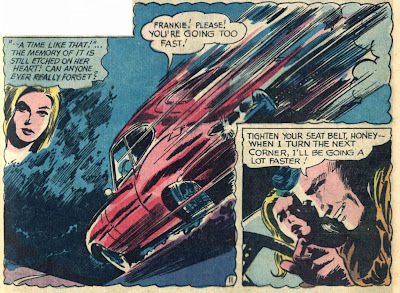 In the early to mid-1970s DC reprinted quite a few of Cole's Golden Age classics. 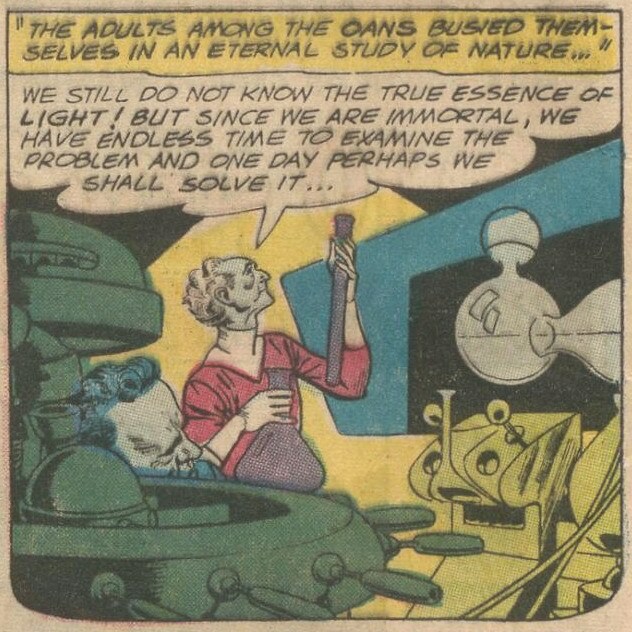 Plas was essentially the straight man in an insane world (kind of like Pogo); a key ingredient that doesn't work in shared universes all that well. Yes, I think that nails it. In Cole's world, everybody was about 90 degrees off kilter. 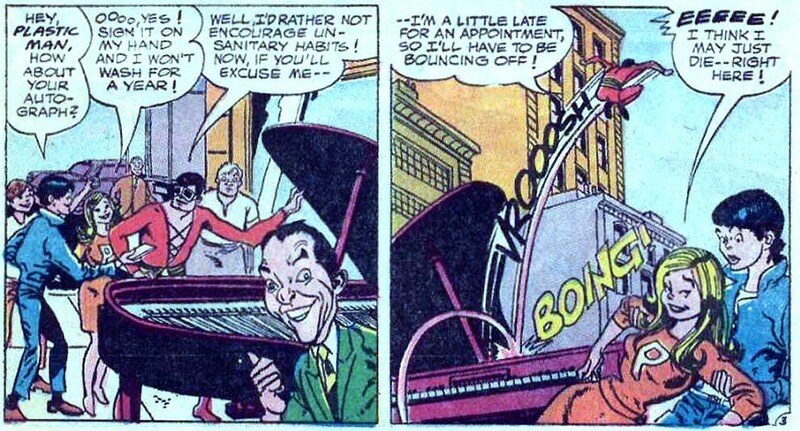 Plastic Man, while he had a sense of humor, was relatively sane. 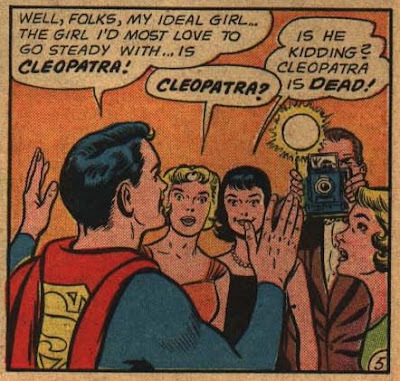 The Silver Age Plas became a prankster in a world that was stuffy and serious which can be amusing but is not terribly original. Of course, this is a paraphrase of one of the sayings attributed to Jesus on the cross. It is interesting to look at some of the similarities of the Odin/Thor relationship with that of Jesus and God the Father. If you look at the God of the Old Testament, he's very much like Odin: regal, imperious and somewhat haughty and capricious. Jesus is like Thor in some ways: came to Earth to help the humans, long-haired, etc. Of course, Thor relishes battle while Jesus was the Prince of Peace. And Odin does not judge mortals, but rather his fellow gods. Of course, DC has also occasionally hinted that Superman is similar to Jesus, most explicitly in the trailer for Superman Returns. 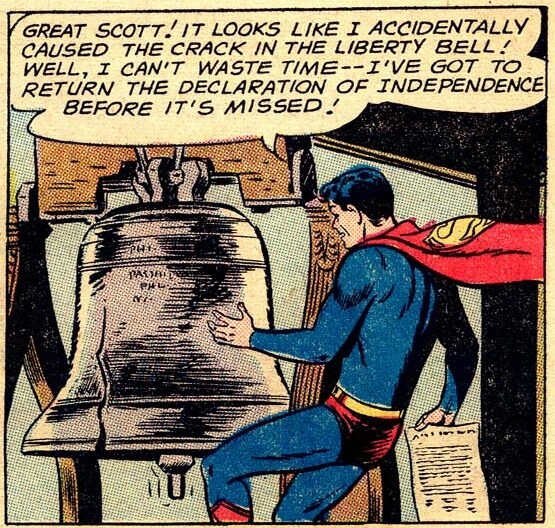 1. Who caused the crack in the Liberty Bell? 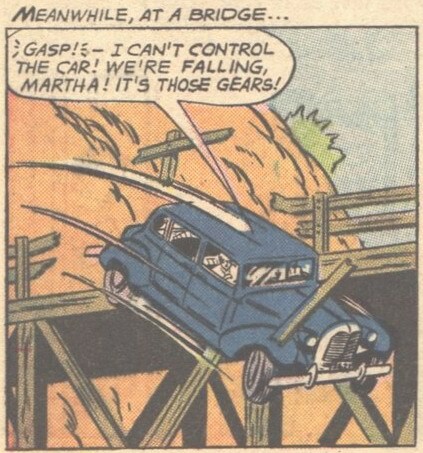 It's part of one of the nuttiest Superboy stories ever, from Adventure #296. Superboy goes back in time and helps Paul Revere, John Hancock and Ben Franklin complete their most famous actions. 2. I was a teenage hoodlum on Krypton before reforming and becoming a member of the Counter Intelligence Corps in the 30th Century. Who am I? Dev-Em, who came to Earth in a modified bomb shelter and bedeviled Superboy before going to the future and turning over a new leaf. 3. What civic function did Pa Kent perform? Pa Kent was a member of the parole board at the state reformatory. 4. Who saved Superboy from certain death at the hands of the Kryptonite Kid? In an oddball twist, Master Mxyzptlk saved Superboy on that occasion, explaining that he did so because he didn't want to lose his favorite opponent. 5. 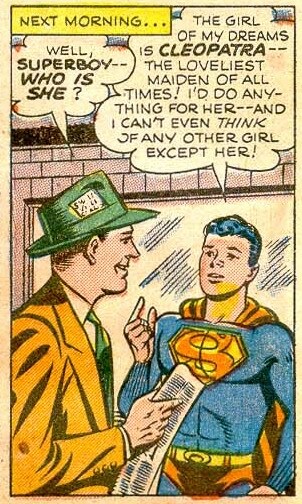 To stop girls from mooning over him, who did Superboy claim was his ideal girlfriend? 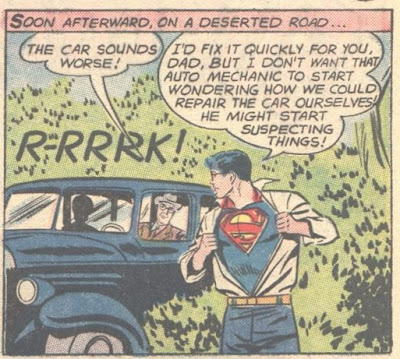 Of course, it is never explained how this doesn't qualify as lying, something that we are assured Superboy would never do. Michael Rebain was the first to get #2. Anonymous got that question right and was the first to answer #3. And don't try to stump Commander Benson, as he got all five questions right, including being the first to answer #s 1, 4 and 5. Great job! Update: Kate also got #2 right.